This walk is an absolute cracker. This is sangle walking for its own sake, and it follows a spectacular line for some 2 km, high amidst les Rocheurs de Fouda Blanc which form the south-east corner of l'Alpe (map). Whilst the route has no scrambling to speak of, it is the most exposed described in this guide, and it is strongly recommended that you refrain from sampling its delights until you have gained experience with less extreme sangle paths, such as that traversed by Sangle de Belles Ombres on the east side of l'Alpe, and that you are confident in your ability to cope with exposed situations. Some steep exposed vegetation needs to be crossed, so it is a place to take great care in wet weather. It isn't a long day, so you can take your time making the most of the awe-inspiring locations. The starting point is les Varvats (1042 m, grid ref. UTM 31T 72587 50328) - a small group of houses elevated 250 metres above St. Même, with the advantage of a small parking area for a dozen cars. There are splendid views across the cirque towards the Guiers Vif resurgence waterfalls. Follow the main track out of the car park to the south-east. This is a well contoured forest track, and easy going. After about 30 minutes, the path rises to pass a reservoir and crosses a stream (a source of drinking water). Ten minutes later there is a junction. The TOP 3333 OT map is a little misleading at this point, as it appears that the main path (GR9) continues to contour to the right under the Roche Blanche - the obvious route, however, rises up into the Vallon de Pratcel. This is reached an hour or so after leaving the car. The Vallon de Pratcel follows the line of a prominent geological strike-slip fault, with the gorge formed by the erosion of a graben formed by subsidiary faulting. It's a lovely valley - flat floored with cliffs rising on either side, and covered with forest intermingled with exquisite clearings and meadows. In a further 10 minutes the path diverges with the smaller path continuing along the valley towards the col de l'Alpe, and our path rising to the left towards the Pas de l'Echelle. We follow this for about 15 minutes almost to the top, until level with the base of a cliff to the left, easily identified by its prominent overhang. The sangle path follows the base of this cliff, and is vaguely way-marked with ancient orange markings. This path is little used, and the line isn't always immediately obvious as the first part traverses some fairly wide grass terraces. At one point it ascends a grassy slope which can be slippery when wet. Initially, the going is merely pleasant, but once round the southern nose, the exposure starts for real. After 15 minutes or so, the path contours round a wide gully, and past a large rock shelter, which gives some relief. Here, or on a small col a few metres further on, is the last opportunity to sit down in comfort before the summit ridge, so it's a good time to take a meal break. The view from here over the Guiers Vif waterfalls, across the Aup du Seuil to the col de Bellefond is spectacular. For the next 30 minutes, the path is narrow, the exposure sustained (Difficulty 3), and it provides a memorable experience. It follows the higher terrace in the photograph (above the one with the obvious path). Finally, we contour into a gully, with a path rising to join us from the left. 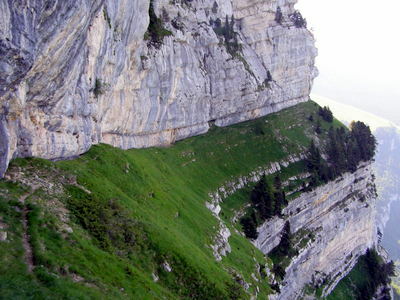 This is the same path which is climbed by the other walk described from les Varvat (the cave with the ladder leading into the roof is just a few metres below). Turn right, and ascend the gully to a crack. This is an awkward, but not exposed, scramble which is a lot easier if rucksacks are taken off first, and passed on up. The scramble takes you onto a beautiful terrace path, which you follow for a few minutes, the rocks above being the final obstacle to the crest. The path eventually plunges into the cliff by means of a rock corridor. This is followed around a couple of right angles to reach the summit crest, some 2½ hours from leaving the car. Once at the edge, follow one of the two paths that go north to le Pinet - the one nearest the crest is the most fun. It's a glorious flower-strewn path, with fantastic views on both sides. The summit with its cross is reached after about 40 minutes. As one would expect, the views from the summit (1867 m) are outstanding in all directions including a view of one of the 2016 landslips on Mont Granier, and a aerial view of la Plagne below the sheer 400 m cliffs. It's a wonderful place for lunch, and tends to be less frequented than the main tops of Chartreuse. To return, start back along the ridge until after a few minutes the main path, way-marked with yellow flashes, leads off to the left. Follow this until it turns to the left down a shallow valley. Here we turn right, following sheep tracks along the plateau which is used for grazing. Contour along the plateau, ignoring the water source down on the left. In less than 20 minutes from starting on this path, a larger path will be met, and the two combined start to descend past a large doline. A few minutes later, the path descends into a deep valley with a major path coming in from the right. The two merge, climb out of the valley, and descend a rake under a small rocky outcrop, into the main valley near the ruins of an old habert after a further 20 minutes. From here, you can make your way across to the Chalet de l'Alpe, a bergerie, and pick up the GR9 which is followed to the right. This crosses some beautiful areas of pavement and rock gardens, before dropping down the Pas d'Echelles into the Vallon de Pratcel. Turn right at the bottom, following the valley down to the GR9, and hence back to les Varvats reached some 2½ hours from leaving the summit. Instead of going up the gully at the end of the sangle, one can continue straight across to traverse the Sangle du Pinet which can be followed all the way to below the summit of Le Pinet. This sangle is a bit of an anticlimax after the what we have just been along - it's less dramatic, and more awkward under foot. The route is easy to follow, but it is only a trace in most places. The end, under the summit, is marked by a cairn. Here the path ascends a little, and then traverses back to the south to emerge on the crest about 150 metres from the summit. It is worth doing once you have enjoyed the main route described above.